For those of us who don’t only love to read books, but write them as well! 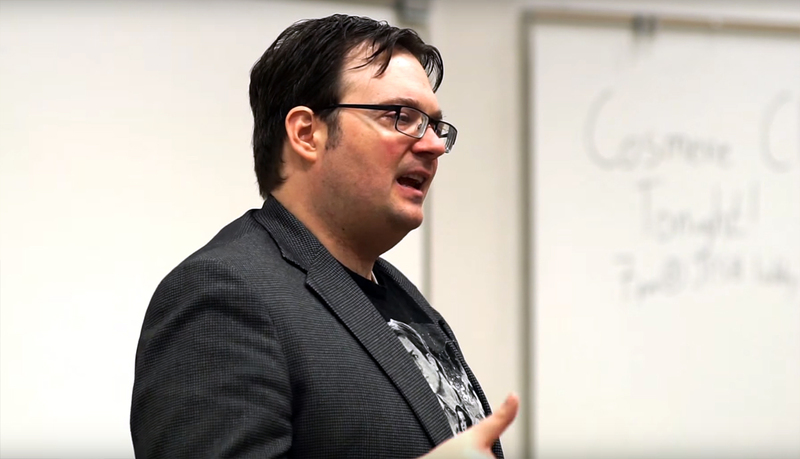 One of the coolest experiences I’ve had as a student at Brigham Young University is taking Brandon Sanderson’s writing class. I took the class a year ago as a junior. I loved it. In fact, I loved it so much that I got back home late last night from his class. That’s right, I’m taking it again. I mean, why not? It’s a roughly one hour class that meets once a week–I can fit it into my schedule. And last year’s final was a pizza party/book signing (yes, you read that correctly). Many of us book lovers don’t only love to read books, but we also love to learn about writing books. When we attend an author signing, aren’t we often treated to some sort of “behind-the-scenes” story about the author’s writing process? It’s fun and interesting to learn how books are created and what makes the best books so great. Brandon Sanderson, one of the largest names in today’s fantasy scene, has solidified himself as an incredible writer. His Mistborn books are among some of the best I’ve read in years. I rarely forget to recommend his Reckoner’s Series when talking about YA books. And did I mention that he completed the legendary Robert Jordan’s Wheel of Time Series? I had heard that Sanderson was teaching a class at BYU, but I had no intention of attending school in Utah at the time. Attending his class seemed like something so out of reach–something I’d never get to experience. So when I finally chose to complete my undergraduate studies in Provo, Utah, I knew that I couldn’t let the opportunity go to waste. The thing is, attending Sanderson’s class is something that so many writers dream about. But here’s the cool thing: you can watch just about every single one of his lectures online for free. They’re on YouTube. So how does his class work? The class is split in two parts: lecture and workshop. The majority of us are in the lecture portion of the class–that’s the portion that’s available online. The workshop is only open to 15 students. You have to send an application to get into the workshop. (No, I haven’t been admitted into that portion of the class… yet). For those who aren’t in the workshop, he encourages us to form writing groups. Last year was my first time trying out a writing group–and it was fantastic. Between the lectures and the continuous feedback, I was motivated every single week to write my novel. In fact, I was submitting 4,000-5,000 words to my writing group every week. Six months into the year and I had completed a 125,000+ word novel. I’m not a fast writer, so getting that much done in such a short time was a huge accomplishment for me. And credit is due where it’s deserved. I know I wouldn’t have gotten as much writing done last year had I not taken the class. And that’s why I’m back in his class, why I’m writing this article. Everyone who’s seriously wanting to write a novel–especially something in fantasy and science fiction–should know about this resource. Sure, you can’t directly ask him questions, and you won’t get to attend that pizza party final, but you’re still getting about 95% of the lectures. Hopefully some of you book lovers who love to write will get something out of this class like I did! Lecture 2: Cook vs. Chef – What makes a story, character building. Lecture 3: The Illusionist Writer – Characters, promises, 3-act structure, and Brandon’s plotting method. Lecture 4: World Building – “The iceberg,” physical and cultural aspects of world building, writing the other. Lecture 5: The Box – Hero’s Journey, rags to riches, viewpoints and tenses. Lecture 6: The Business of Writing – Traditional publishing vs. self-publishing, small presses, book deals, marketing. Lecture 7: Character – Show don’t tell, PROMS (Past, Relationships, Obligations, Motivations, Sensibilities). Lecture 10: Plotting – What is plot, promises and surprises, satisfying endings, author voice. Lecture 11: Dialogue and Agents – Dialogue, conflict, finding an agent. Lecture 12: Q&A – Writer’s block, conventions, feedback, some experiences from Brandon’s writing career.